After missing my first weekend in six months and watching the gauge rise and fall, I knew it would be an interesting day. Leave it to the bayou to welcome me home. I’d gone out 30 times in 26 consecutive weeks to work the bayou, but last week I had to go to Florida to do a certification trip for a bunch of scuba students. Yeah, yeah, being a scuba instructor is such a pain, but somebody’s got to do it. I was watching the water levels on the restored gauge at Bluebonnet and wondering whether it was going to be a long day when I returned. Past high water events have generally left some work behind, after all. Arriving at the bayou, the chain gauge showed three feet of bridge clearance, which was right where the Bluebonnet gauge indicated it should be. Three feet is a nice middle level for the bayou. It leaves plenty of room to just duck slightly under the bridge and plenty of water to ensure you don’t hit any shallows. 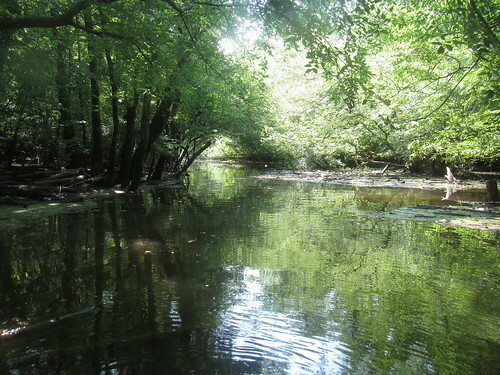 It seemed about perfect for a day on the bayou, and so, I set out down the bayou. Well, I was about 20 minutes ahead of schedule, so I made a quick detour upstream to check on mile marker 4-1/2. It had some vines climbing across it, but a quick tug cleared those, and back to the launch point I went for the designated 8am (in case anyone was planning to join up). Seeing nobody else at the park, I then headed downstream. 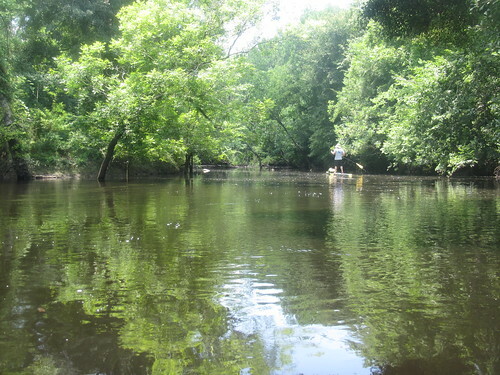 There was almost no current at all, but with the water level as it was, the paddle down the bayou was quite easy. I *did* feel the thump of the rainbow as I passed by. Fortunately, it seems quite content to remain in its last known position. That thing does not budge easily. I also noted the exceedingly voracious mosquitoes following me in a cloud. The insect repellant was doing its job, but they seemed to be waiting for any opening. They were so persistent that I ended up refreshing my chemical armor three times during the day (and a few still thought me worth investigating). 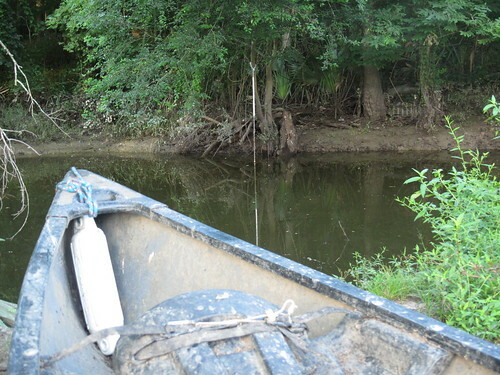 Other than the mosquitoes, there were no problems to report in the first two miles of bayou. It seemed the bayou missed me, for as I paddled under the larger set of power lines by mile two, what did I see but another queso fresco bucket! I haven’t collected one of those in many weeks, and I’d all but given up hope of expanding my already considerable collection. In case that wasn’t enough, however, the bayou also gave me another Clearly Canadian bottle. It was souvenir day on Fountain, apparently, although everything has limits — I didn’t get any new speed bumps this time. Having welcomed me back with gifts of cool litter, the bayou then decided it was time I got back to work. 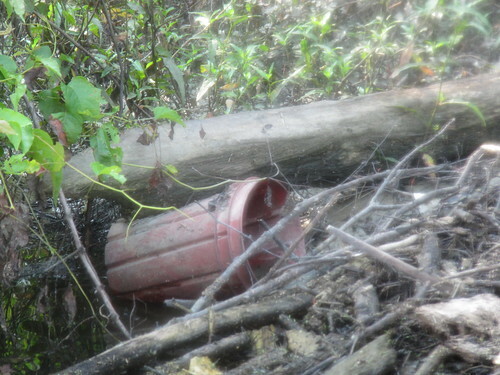 The low-banked area that begins just below mile two has been a hotspot of fresh collections of flotsam and logs. Caught early and dealt with, they are not large and do not cause too much difficulty getting through, but every time the water rises, more appear. This seems rather logical, as the bayou can be positively lake-like during high water, redistributing collected logs throughout a vast area. Gradually, this will taper off — every time a log catches, it is magically turned into two or more shorter logs — but there are likely enough long logs left to hold boredom at bay for some time. At least they only come out in numbers during high water. There were only a pair of significant accumulations, plus a handful of smaller catches (enough to make the trip down take about five hours of paddling and work). Oh, and there was also one downed tree near the last half mile, but it was small in diameter and for once *not* covered in vines — woo-hoo! It wasn’t a bad day, but as I was working one of the larger accumulations, I was really starting to think it would’ve been rather helpful had Mike been there to assist. 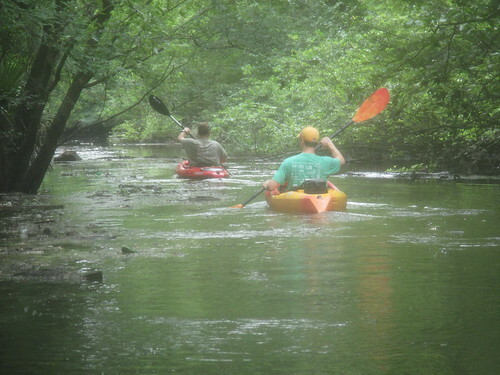 Naturally, it was right about then that I glanced upstream and saw two kayakers coming my way. (They’d launched at Highland Road Park and were doing a through paddle to Manchac Park, apparently.) Meeting people out paddling the bayou is a *fantastic* way to get a second wind, and this was no exception. I made quick work of most of the newly fallen tree before starting the last leg back to the park. Apparently the work was more than I’d thought (or I was more worn going in), as by the time I was polishing off the limbs, my right arm was really starting to complain. I took it easy (relatively speaking) the rest of the way, with my now very securely mounted GPS receiver showing my progress. 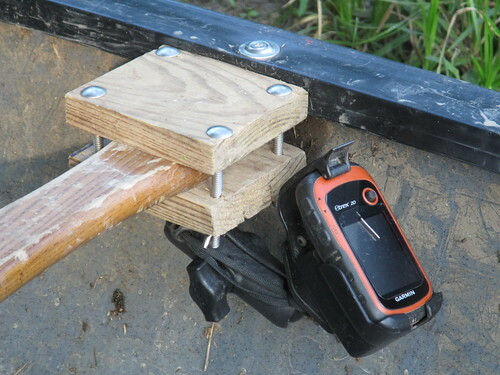 (It’s out of the way when I’m pulling logs over the boat to saw them up, and there’s no way it can be knocked directly overboard — also, note the safety lanyard for redundancy.) Even taking it easy, I was back at the park at 2:30pm, which is quite earlier than many trips out. All in all, it was another great day on the bayou. There weren’t too many problem areas. I met several paddlers. 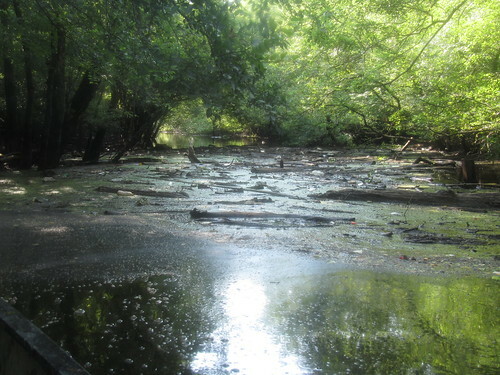 The bayou was clear when I left it. Oh, and I didn’t lose any equipment (well, I recovered the log rake that went overboard, and it only took a few minutes). With the water levels as they are and the forecast for this week, it looks like we should have excellent conditions to give a tour on Friday and follow it up with the “bigs” collection run we’ve been planning. I can hardly wait.